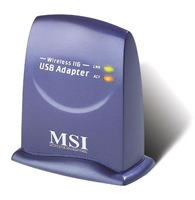 MSI UB54G USB2.0 Wireless 11g USB Adapter enables 54 Mbps wireless Internet access to either your desktop or notebook PC. Free-standing design is ideal for external placement on any surface. The included 5-ft (1.52m) USB cable lets you locate the UB54G where signal is strongest. Setup is now made quick and easy with a step by step Setup Wizard. High-level WPA encryption shields your network from unauthorized access without sacrificing performance. And since the adapter is hot-pluggable, you can take it with you from home, to work, and back. This software for 802.11 Cardbus/miniPCI/PCI/USB interface. The software will install the MSI WlanUtility/APUtility and driver to user computer. The supported OS contains Windows 98SE/ME/2000/XP. Wow…perfect driver selection. Had what I wanted within 30 seconds. I thought my device was probably obsolete. Thanks.